Pruning solanum rantonetii - Besides the difficulty of pronouncing it's name, this is a lovely plant. Strong and gentle at the same time, the question here should be why prune at all? If you're using your solanum rantonetii as a hedge, the answer is obvious. 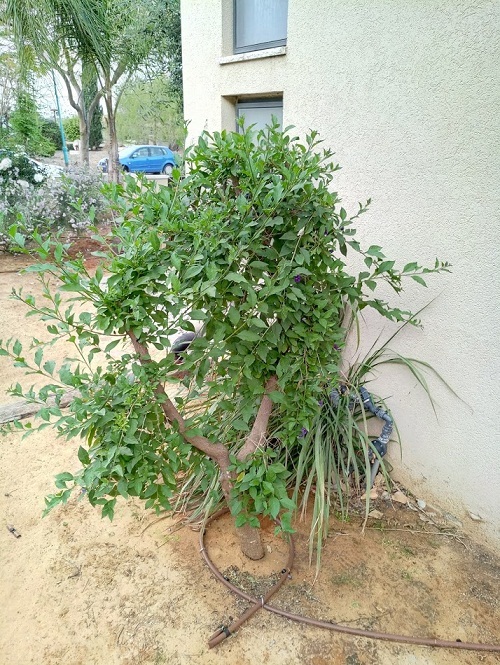 But, if you're growing your growing solanum as an ornamental plant in the garden or in a container, in that case pruning solanum rantonetii becomes more critical and your plant will definitely need to meet your pruning shears every now and then. For those of you who are familiar with solanum, you'll know it has beautiful blue-purple flowers, you would also know it has a tendency for thin dry branches. This is especially true when its soil is not drained or when it's exposed to strong winds etc..
What I want show you on this page is why I chose to prune the way I did, and most importantly what I wanted to achieve. 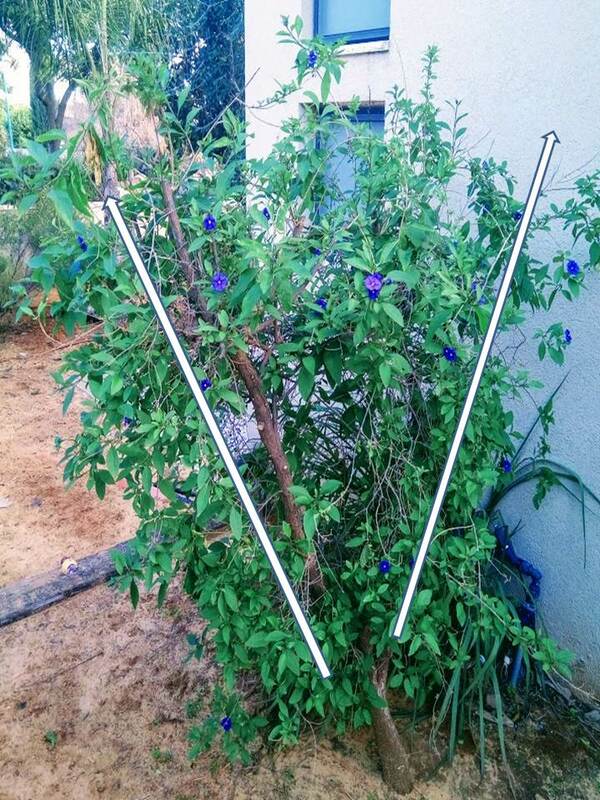 Two leading stems growing in a V shape. A tendency for thinness here and there. So what's my plan? Great question! My plan is to encourage strong vigorous new growth, while keeping my plant looking awesome by pruning solanum rantonetii! The first thing I'm going to do is trim those magnificent small branches and reduce the shrub's canopy, by about half. Prune them where you see them, and I promise it will encourage new growth. Next should be the dead grey color branches. Note: Some of the so call dead branches have no leaves on them along the branch. But if you follow the branch all along, you might be surprised to find that you do come across fresh green leaves along the young stem. When do you prune solanum rantonetii? For the purpose of maintenance, you can prune throughout the year. Cutting small or dead branches you can do freely anytime. 1. It's wise to prune hard a minute or two before it gets too warm. This will ensure you make your solanum "explode" and give you amazing growth and bloom throughout the year. 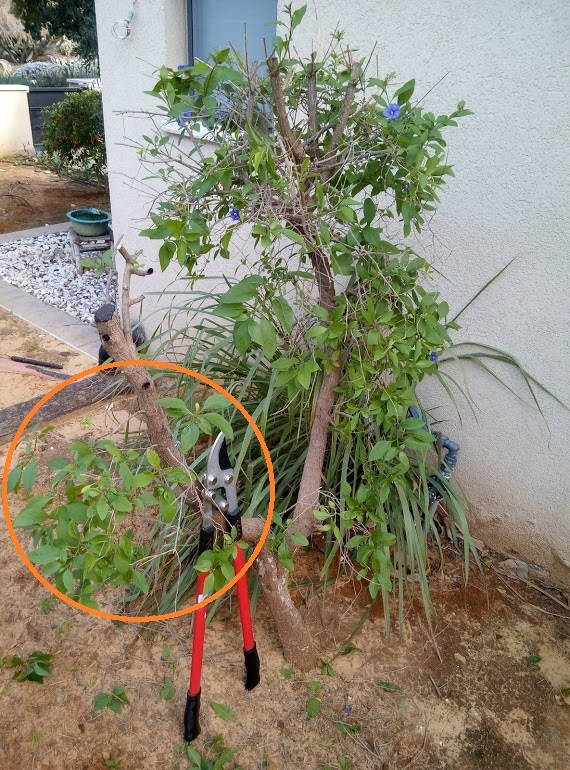 Another important factor is that after you prune so hard, you're leaving your tree very exposed to extreme weather conditions... so better do it when the weather isn't too hot, or two cold. Farther more, pruning that hard exposes a large wound, or several) that you wouldn't want to expose to extreme cold or hot weather. Where to prune? remember the V shape marked on the first picture? Well, I want to believe that by now you understand what i'm trying to tell you. My plan is to prune the left stem hard, about half way up, so as to get new low growth. The right side will stay the same for now. I warned you I was going to prune hard... Now you know how I did it! and here are the final results: we kept the look, reduced the capacity and encouraged new growth. I'm going to have a wonderful blooming season and so are you! And 'ain't that great!! Note: Before cutting the stem make sure that there are branches with green leaves below the spot you're planning on cutting (see the orange circle). It's critical for optimal Photosynthesis, and will help the solanum develop further growth under the cutting point. My preferred pruning shears for pruning solanum rantonetii would be short blade bypass pruners to handle the small stems. 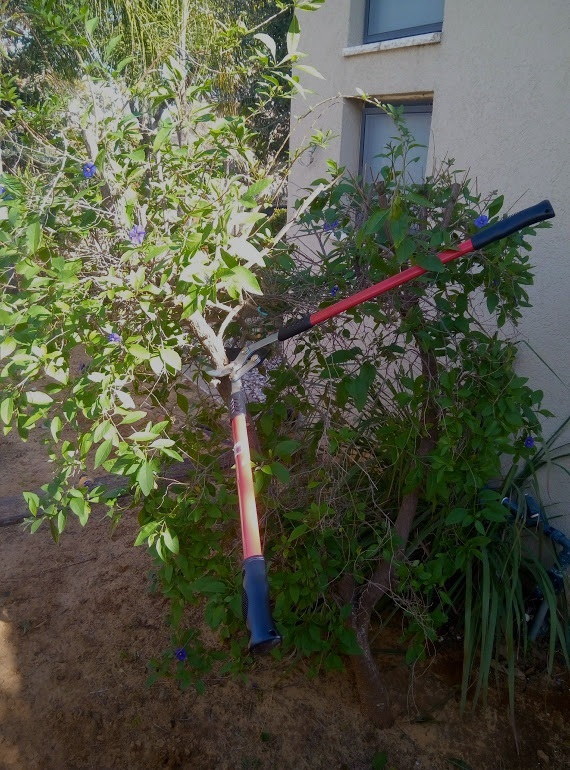 However, using bypass loppers can help you with pruning the 2-3 inch wide branches easily. Solanum rantonetii stems are thick but soft on the inside, not too difficult to prune.